Mt. 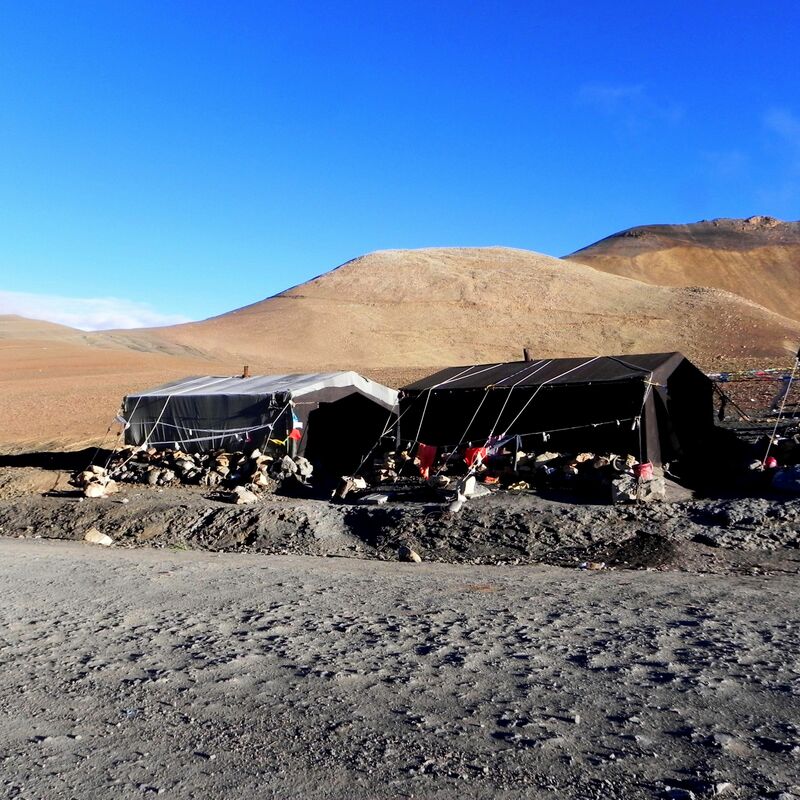 Everest Base Camp Adventure: Off the beaten path.. Heading westward, the Friendship Highway crosses the vast Tibetan plateau along the Yarlung Tsangpo Valley. Alongside - amazing landscapes surprisingly vibrant with colors and light, barren mountain peaks and then snow-capped ones, narrow passes and then out of nowhere swaths of flat land dotted with stone-built houses, fields of crops, grasslands sparkled with yaks and then back cold desert as far as the horizon goes – all that is constantly changing like in an old kaleidoscope. Driving is a continuous roller-coaster - left then right and up and down the passes. First one – Lagpa La not far from Lhatse is just at a mere 14,750 ft (4500m). From here the highway descends steeply back to the Yarlung Tsangpo valley where it forks into two branches. The China National S219 crosses the river continuing westward along the valley towards the sacred Mt. Kailash and Lake Manasarovar. It continues making a long loop along the western Tibetan borders then splits once again heading west to Kashmir and north towards the desolate area of Taklimakan Desert in Xinjiang Uyghur Autonomous Region of the PRC. Source: Profile was measured and made available by Laura Stone during her two years biking journey across Himalayas. The China National S318 (Friendship Highway) turns south-west climbing steep mountain range to cross the Gyatso La pass at 17,130 ft (5220 m) - the highest one on the Friendship Highway. The large gate across the road marking the pass opens the breathtaking views on the vast upland with Himalayan range closing the distant horizon. Known as the Tingri Plain it is the highest plateau crossed by the Friendship Highway with an average altitude of about 14,500 ft (4400 m). It is a gateway to Mt. 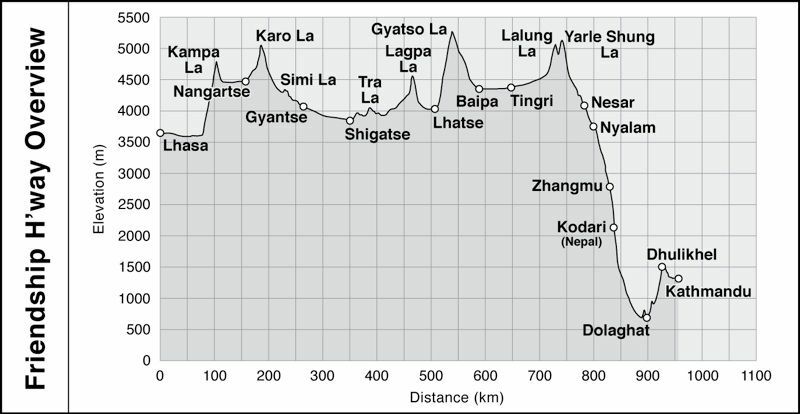 Everest, so actually the high altitude is an opportunity for an overnight acclimatization in Tingri before moving up the next 3,000 ft (1000 m) to the Mt. Everest Base Camp. Near Tingri for the second time leave the Friendship Highway heading south towards the Mt. Everest Base Camp. For a while we also say good-bye to the paved road enjoyed for so long. Far from the fertile Yarlung Tsangpo Valley, the landscape is drastically different. Shallow, fast running rivers carrying mountains’ dust do not provide enough of support for life, anyhow hardly present in any form at these altitudes. It seems that only yaks can still survive these conditions finding here and there islands of grass or rather a thin layer of something resembling moss. But not for the first time during this trip, life is showing strong resilience. In the middle of this apparently lifeless desert we spotted a fox hiding behind the lonely rock, then farther a group of shy goats climbing the cliff. On the way we pass by little settlements - no more than few stone houses encroaching on this desolate land, and encampments of nomadic herdsmen wandering across the plains. The road – partially dirt, partially stone, partially non-existing or washed-out by fast running water is rough and bumpy. Fortunately driver of our Toyota Cruiser skillfully negotiates deep holes, streams, gaps and chunks of rock. Slowly but surely we climb the terrain driving through series of more than 40 switchbacks to reach the Pang La pass at 17,060 ft (5200m). 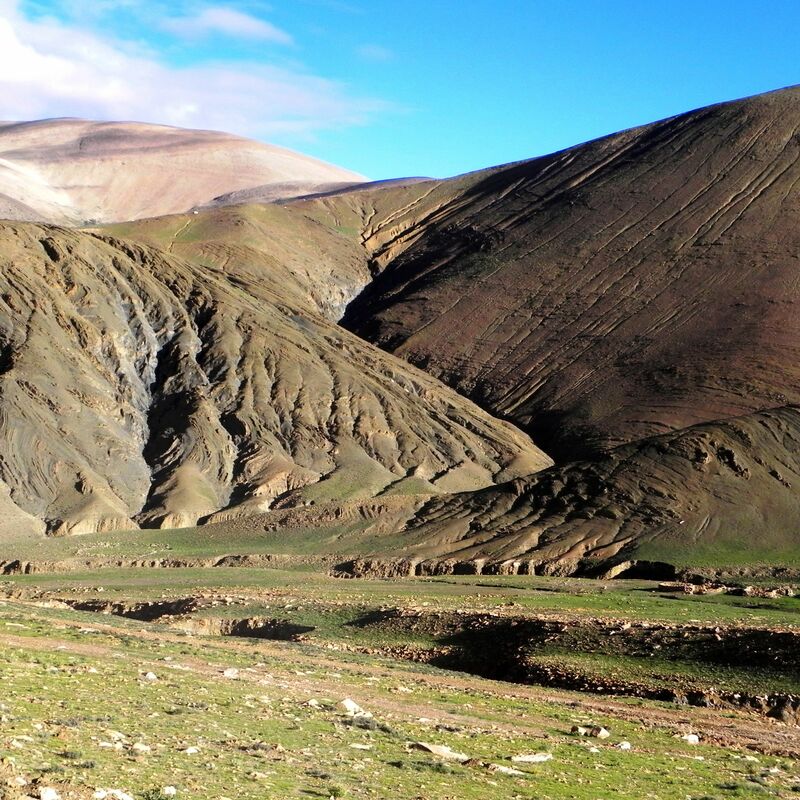 Weather permitting at the top waits one of the most spectacular views in Tibet – the Himalayan Range. The imposing barrier of its highest peaks – Everest, Lhotse, Makalu, Shishapangma and Cho Oyu (Qowowuyag) closes the nearby horizon. This video shows the decent from Pang La pass via the single track dirt road towards Padu. It also offers great graphic presentation of the path towards the pass. From now on starts the personal encounter with Her Majesty Mt. Everest and the Base Camp. As it will take you more time to "digest" the scenery, calm emotions while grasping for breath (at EBC there is only 50% of your daily portion of oxygen) the corresponding links are provided at the bottom of this page. Going back to the Friendship Highway we take the short-cut via Lamma La pass. Frankly, here in this moon-like landscape of rocky ridges, exposed faults and folded layers of former ocean floor all tracts seem to be shortcuts requiring higher than average sense of orientation and intuition-driven GPS. 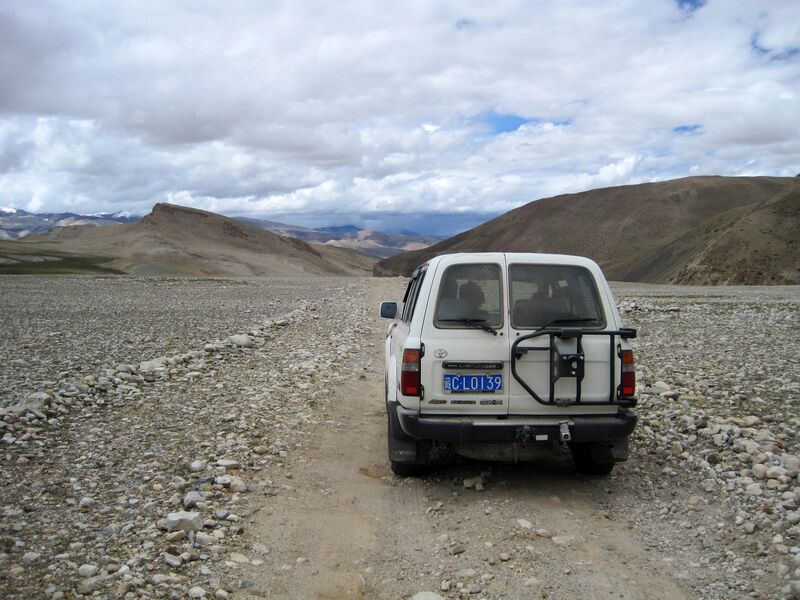 Toyota Cruiser was the perfect match for the wastelands of the Tibetan plateau. After few hours of driving with a sense of relief we joined back the civilization - the paved Friendship Super-Highway. With the sense of regret we left behind the world’s highest mountains range representing the nature at her best. Mt. Everest’s North Face so close, almost at the touch of the hand, ready to be befriended, yet at the same time so distant, mighty and proud despite the fact of losing her virginity to Edmund Hilary and his followers. Little did we know that in front of us waits another spectacular section of the Friendship Highway – a ride along the cliffs of the deep, misty Sun Kosi Gorge. On the right - the rock piles and prayer flags left by pilgrims are the most visible symbols of the Tibetan Buddhism. Mountains rivers are carrying "tons" of sediments hence their muddy-whitish color. To make things even more dramatic, the highway first climbs the double pass of the Lalung La and then Yarle Shung La (also called Nyalam Tong La) – both five-thousanders at correspondingly at 16,570 ft (5050 m) and 16,900 ft (5150 m). But that is the last accent (indeed quite memorable) marking the edge of the Roof of the World. Back to the Friendship Highway. Right - This monument on S318 marks the distance of 5000 km (3107 miles) from Shanghai. On the right, engraved in stone the symbol of Shanghai - famous Pearl Tower (TV tower). Countless prayer flags entwining the decorative gate above the road send as the Buddhist farewell blessings. We still did not know how much we needed them down the road. Most mountain passes on the Friendship Highway are marked by the decorative gates. Tibetans quickly adopted these structures for prayer flags. In strong wind they ceaselessly “murmur” sending endless prayers towards the mountains. Reflected from Himalayan slopes, magnified in strength they eventually reach the heavens. Indeed, praying flags are one of the most recognizable characteristics of the Tibetan landscape and symbols of the Tibetan Buddhism. Long strings of colorful flags with written texts of Buddhist prayers use almost every opportunity to “climb” like ivy entwining electric poles, houses, trees, piles of rock….